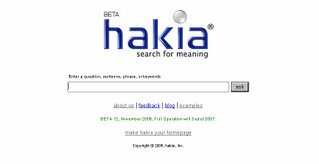 Hakia is building the Web's new "meaning-based" search engine with the sole purpose of improving search relevancy and interactivity, pushing the current boundaries of Web search. Just Enter a question, sentence, phrase, or keywords, it will show you results. Now, Hakia is in beta, it plans to debut its full-capacity search engine in 2007.